Barnes & Noble College (BNCB) operates 770 campus bookstores nationwide for top academic institutions such as Harvard, Yale, the University of Pennsylvania, Indiana University, and Georgia Tech. BNCB serves over 5.3 million students and faculty, delivering “what’s next” in campus retail and digital learning experience. At Barnes & Noble College, the company is more than just a bookstore operator. They are a trusted and valued partner to the schools they serve, transcending the role of the traditional campus store by delivering an unmatched digital education experience. Barnes & Noble College (BNCB) operates 770 campus bookstores nationwide for top academic institutions such as Harvard, Yale, the University of Pennsylvania, Indiana University and Georgia Tech. BNCB serves over 5.3 million students and faculty, delivering “what’s next” in campus retail and digital learning experience. 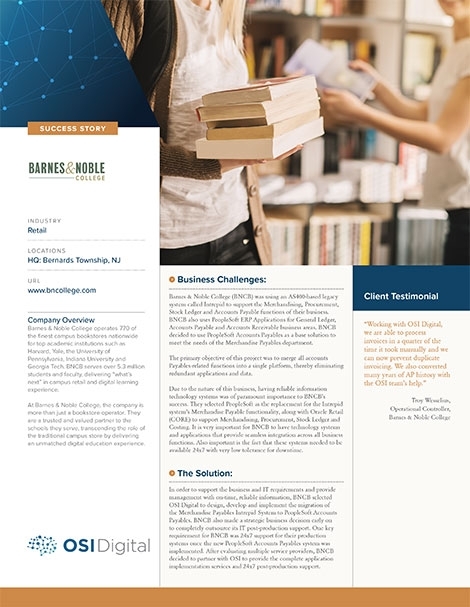 Barnes & Noble College had a decentralized and manual Accounts Payable (AP) process at their stores for General Merchandise (GM) wherein the details of the invoices had to be entered manually into the database. This effort required at least 1-2 personnel per store on a part-time basis to capture invoice details. As the volume of the invoices increased, the scope for human error and data inaccuracy also increased. Over time, it became a tedious, time-consuming and inefficient process. OSI built a JEE based custom Optical Character Reading (OCR) solution for transcribing invoices for downstream AP processing. The OCR solution automated the task of data transcription by systematically reading the PDF invoice files and capturing the data from these invoices into a CSV file that can be processed by the new merchandise payables system.